Whilst Aunty Carli was in labour, Lil was having sympathy pains (although I don't think Aunty Carli was picking her nose in labour - but you never know). Oh, have you seen the sweetness of baby Micah...A-D-O-R-A-B-L-E!!! I can't wait for my turn to rub my cheek on his fresh baby skin. My sewing machine broke down on Thursday night. Bad, bad news. This weekend was going to be sewing weekend. The sewing machine fixer guy thought he would have it ready in an hour or so, then decided that something is badly seized and had to keep it in over the weekend. Fingers crossed it will be up and running on Monday. I have hardly used it all week but now that it is not here I REALLY want to sew again! I am still eating easter eggs and just want them to be over. On Jaron's last day home from work we were going to take the kids to the movies. In the morning Oscar declared that "I don't like the movies, they are dark, go for a long time and give me a headache. Plus I have too much work to do like fixing up stuff around the house and building lego." SERIOUSLY!!! What kid wouldn't jump at the chance to go to the movies! We couldn't convince him so stayed home and saved ourselves $50! We just watched The Princess & The Frog. Awesome. I think I may have forgotten how much I love the old school musical animated Disney movies. Am on the look out for copies of The Little Mermaid, Aladdin, Beauty & The Beast now! Haha! That photo of Lil is priceless. 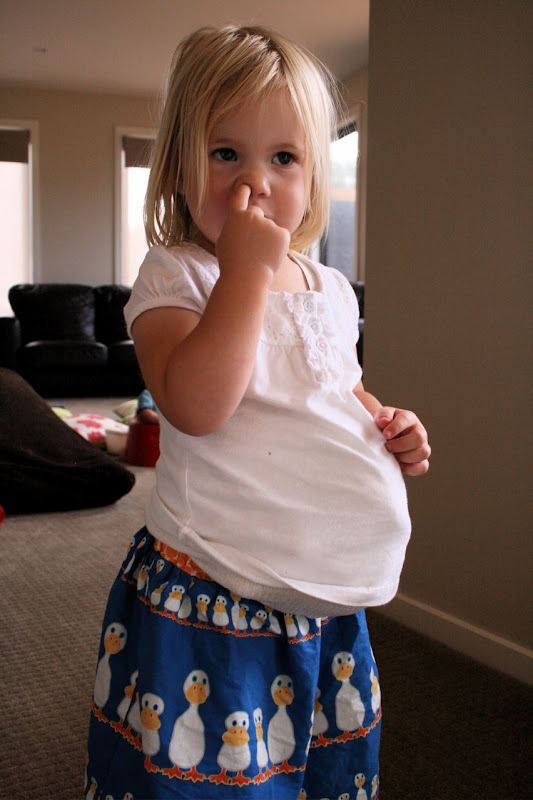 'Pregnant' and picking her nose. Bad news about your sewing machine....hope you get it back soon. hey you probably wont get copies of the other disney movies easily, coz you know how disney does that thing where they are all locked in the vault and they re release one new one every 3 years or so? Like 101 dalmations was only just re released.. You might havta try ebay and stuff..
Lovely 'pick' of Lil - couldn't resist! Hope your machine is back soon - mine needs servicing but I can't bring myself to take it in... I'd miss it too much! We watched Aladdin last night and Beauty and the Beast recently too - they are great movies.